On January 19th, in the early afternoon, an armed robbery occurred at a business in the 6000 block of Monona Drive. 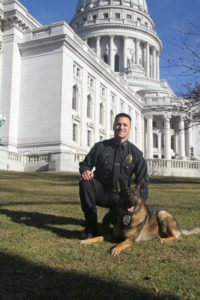 Madison Police Officer Nick Eull and K9 Patton assisted the Monona Police Department tracking the suspect that committed robbery. The track was approximately ¼ mile long and ended at the back door to an apartment building in the 400 block of Femrite Drive. Two articles of evidence were located along the track. Intelligence was gathered and the suspect and an accomplice were contacted by Monona Police officers inside the apartment building and arrested. The two suspects maybe linked to as many as six other robberies in the area. The investigation is ongoing.